Danesfield House is a Grade II listed building, and occupies a commanding position overlooking the River Thames near Marlow-on-Thames. The present house was built in the style of the Italian Renaissance, regardless of expense, by Robert William Hudson, son of Robert Spear Hudson, the Victorian soap magnate and manufacturer of ‘Sunlight Soap’. Building was completed in 1901, so It is assumed that the construction of the surrounding terraced gardens of some 65 acres took place c1901-03. They were restored in 1989-91, and have been meticulously maintained ever since, which is great news, because there is no doubt that James Pulham and Son were responsible for their original construction. There is an Orangery overlooking a grand, formal balustraded terrace along the back of the house, overlooking a parterre with a beautiful Pulham trefoil fountain at its centre. The lawns below lead round to a magnificent terraced and balustraded Italian Water Garden, and there is an artificial rocky pool and stream running along the floor of the valley beyond. These are excellent gardens to visit if one wants to see a wide range of Pulham features contained in one relatively compact space. Danesfield House was requisitioned by the Air Ministry for the RAF to set up a Joint Service Imagery Intelligence Unit during the Second World War, and was bought by the Air Ministry to become the Divisional Head Quarters for the 90 Group RAF (Signals) in 1948. The house became a country house hotel and spa in 1991. A full description of the work done by James Pulham and Son at Danesfield House – together with a number of pictures – can be found in Chapter 28 of Rock Landscapes: The Pulham Legacy – the critically-acclaimed and lavishly illustrated definitive story of the lives and work of James Pulham and Son. Written by Claude Hitching, with featured photography by Jenny Lilly. Published by Garden Art Press. 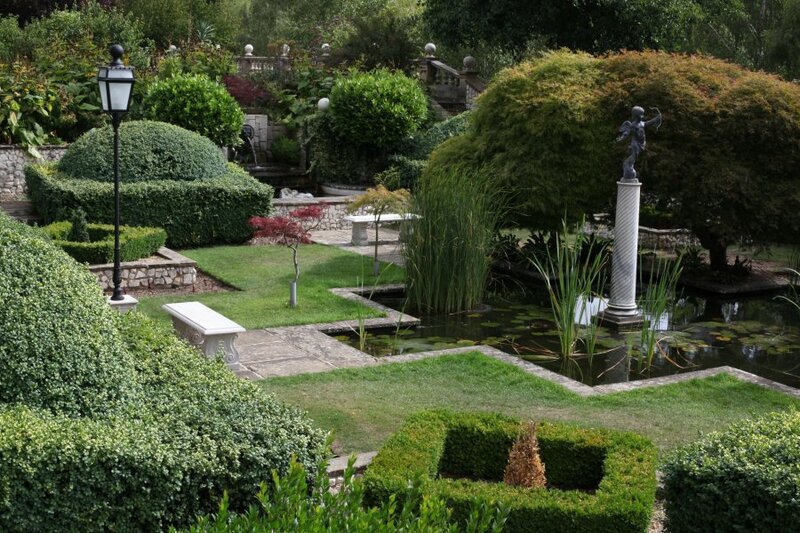 Posted on October 3, 2014 June 30, 2016 by Claude HitchingPosted in Book ContentsTagged . . James Pulham and Son, balustraded terrace, Claude Hitching, danesfield house, Italian Water Garden, Jenny Lilly, orangery, Pulham Trefoil Fountain, Robert William Hudson, Rock Landscapes: The Pulham Legacy, Rocky pool and stream.